The Earth as it might have looked from space during the Ordovician Period, 450 million years ago. The blue and red dots show the location of Scotland and England respectively, south of the Equator and separated by the Iapetus Ocean. 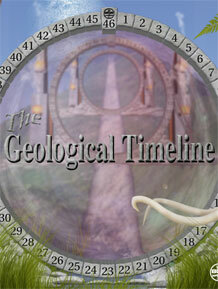 The concept of geological time can be difficult to understand. It is hard enough to grasp the long periods of time involved in human history such as the activities of the Egyptians 4000 years ago, or the Vikings 1000 years ago. If a thousand years is a long time, how can we comprehend a thousand million years? But it is intellectually stimulating to try. Talking about geological time means using large numbers and it helps to break down these vast periods of time into more manageable pieces. The solar system is about half way through its life, so the geological timeline imagines the Earth as a middle-aged person; instead of describing the planet as 4600 million years old, we imagine it as someone celebrating their 46th birthday. The timeline is interactive. You can move forward or back in time, exploring at your own pace. When you reach the end, test yourself with the timeline quiz or try your hand at one of the games. For more information on some of the fossils described, see our fossil focus pages.